Well, it's Wednesday and it's time for another Fab 'n' Funky Challenge. We have got the most amazing Host this week, and it's Sujin and she has picked a theme of 'Flower Power'. What a great effort from everyone for last weeks Challenge I thought that they were all fantastic. As with everything we must pick a Winner, so please check out the Fab 'n' Funky Challenge blog to find out if it was you. But I must thank all of you for you wonderful creations, they were all fantastic. Have a great week everyone and I can't wait to see how you have used "Flower Power" to create your Project this Week. Dare to be Sassy Thursday Challenge - Challenge #224 - Make it Creative! Nutcrafters Challenge - Challenge #66 - Go Girly! The Paper Shelter Challenge - Challenge #154 - Spring is Here! A very sweet looking card with real spring colours to it. Looks fabby. Thanks for joining our spring challenge over at The Paper Shelter. Hi Anne-Marie what a cute and very beautiful card. Awah, love the papers with this sweet little image! Thanks for joining in the Dare to Be Sassy Thursday, and good luck! This is just so pretty and girly and I love the sparkly touches on the flowers. A beautiful card, so pretty! Gorgeous card Anne-Marie! I love this image, your coloring, the DP, the gorgeous colors! Wow! This is a beautiful creation with great details and perfect for our ‘EASTER or SPRING’ challenge. Thanks for sharing your talent with us. Good luck. Stunning card Anne Marie, love the yellow, and how you have coloured that lovely image in. What a beautiful card - wonderful colors and so Spring-like! Beautifully colored as well. 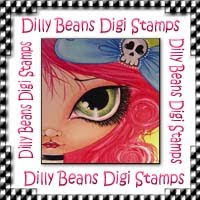 Thanks for joining us at Digistamps4joy. Beautiful - a really sweet image and I love the colours you've used.